The theme for the current Burn2 event, January 27–29, is Fire Moon. The first New Moon of 2017 was Friday the 27th of January; the Chinese New Year is the 28th, which ushers in the Year of the Fire Rooster. The colors for the builds are gorgeous, lots of fire and roosters; near the landing are boards with events listed. Most of the info is there, way more than on the blog. There are some interesting things to interact with. The builds will be up for about a week after this weekend’s festivities. These photos were taken a few days before Fire Moon opened so I could enjoy just being at some of the events. 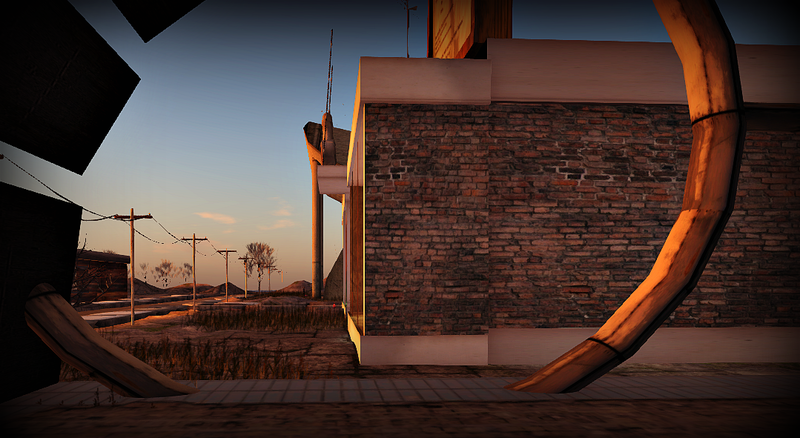 The ever changing mainland has numerous welcoming and interesting spots. One such place is Cafe Klaus, in Patagonia on the Atoll. “A roadside joint and arts venue on Route 1 in the South Western Heterocera Atoll region. A place to relax with friends in surroundings vaguely evocative of the colonial era, enjoy a morning coffee, a sundowner or cocktails and jazz on the verandah.” Cafe Klaus is always open. Regulars to the Sundowners Events often show up via one of a variety of rides, (I like to ride a scooter to and from). Sometimes there are spontaneous road trips to check out some new development of interest. 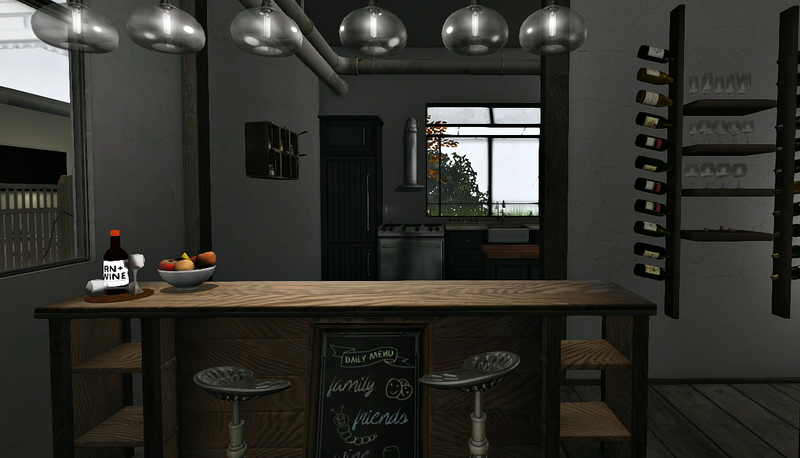 “Sundowners is served on Mondays and Thursdays from 3 to 4pm (SLT). 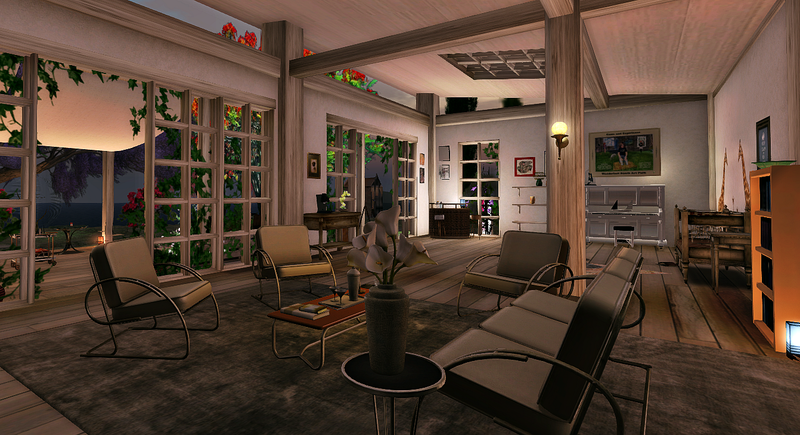 Do drop in to enjoy the evening light, sip a cocktail and engage in casual conversation as the shadows grow longer. Klaus will be around to make you welcome and you may even make some new friends.” This time of year one arrives in the dark and we watch the sunrise until the time changes and it will once again be cocktails and chat while the sun goes down. 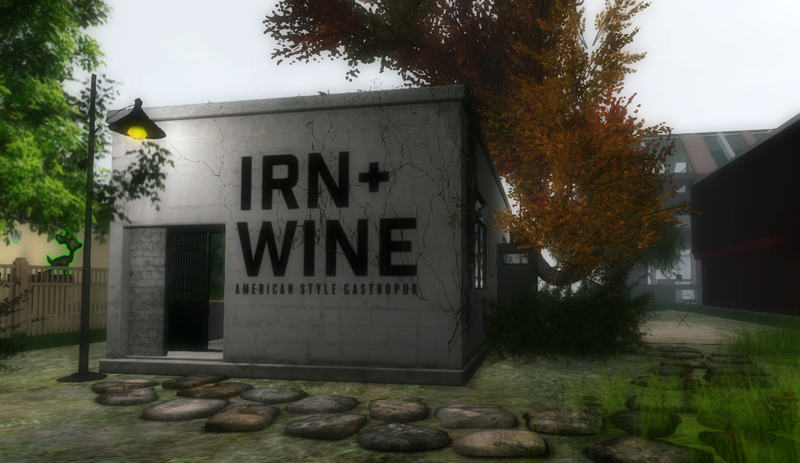 Also on the Atoll, IRN + WINE Restaurant and Hangout is a new place in Ethmia. For well over a year, Art Study Group has been meeting, lead by avatar Tiffany Mosienko. It began at Art Farm in the latter half of 2015, met in a variety of places afterwards, mostly at the former Artist Colony in Deimos and has now been meeting in a lovely spot at Community Virtual Library, Bradley University. 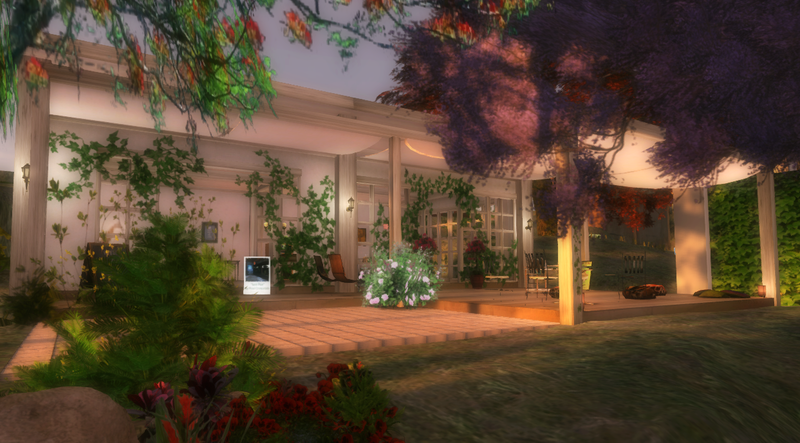 The topics are related to art using 3D avatar worlds. Some recent field trips have been to Michael Wright Fine Art Museum, UTSA ArtSpace and Lichtbringer. The group meets for about an hour. Mondays at 6:00 p.m. SLT in text chat. 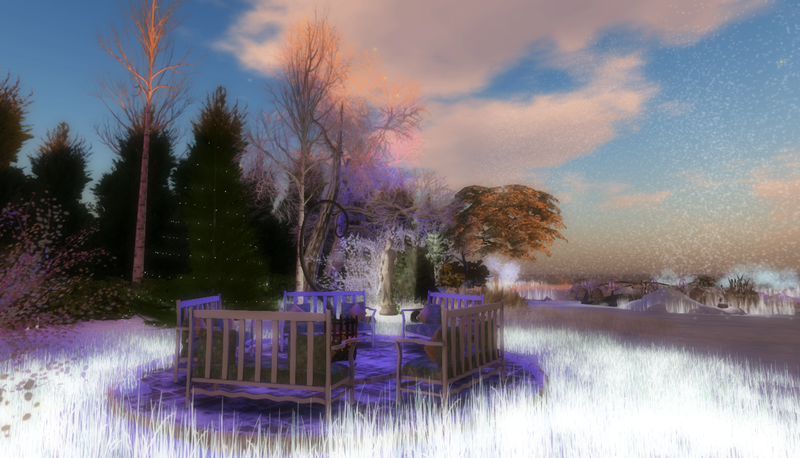 The light changes beautifully while avatars have discussion around the fire. Notices are posted in VB Friends group. All are welcome. I’m enjoying reading the storytelling about The Sail Inn Motel in Askja. “Fine dining and lovely rooms. No vacancy, but visitors welcome. If you visit, the door you go in looks like the one in these photos. There are about fifteen or so short Tumblr posts with photos about the stories taking place regarding the Sail Inn Motel, beginning here. A new cafe has opened on Satori on a 512 parcel simply called Wyrd. Rocking chairs have been added out front since the above photo was taken. The Greedy Greedy game on the roof has been quite popular. Otherwise, it’s a quiet, pleasant place to talk or do some work. Should you go and find the game table occupied, the established (and recently landscaping upgraded) Saul’s Place nearby has a Chalkboard Pictionary Game, Connect 4, Chatterbox sets and Greedy Table for everyone to enjoy. I’ve visited Bryn Oh’s Hand at Immersiva at least five or six times. I use the Lab Viewer on a low-end laptop with an often poor internet connection. Also I have a serious chronic illness that affects my experience in world. 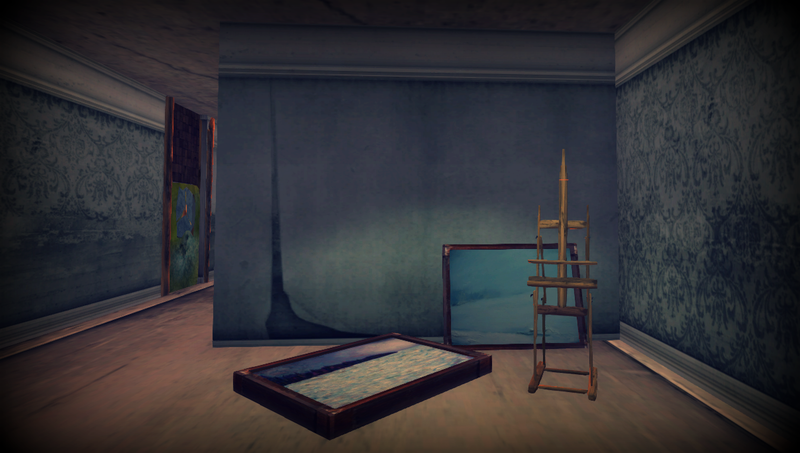 In the past I’ve found Bryn Oh’s sim exhibits to be inaccessible; I simply wasn’t up for dealing with them. Many of the posts on this blog are about art exhibits. 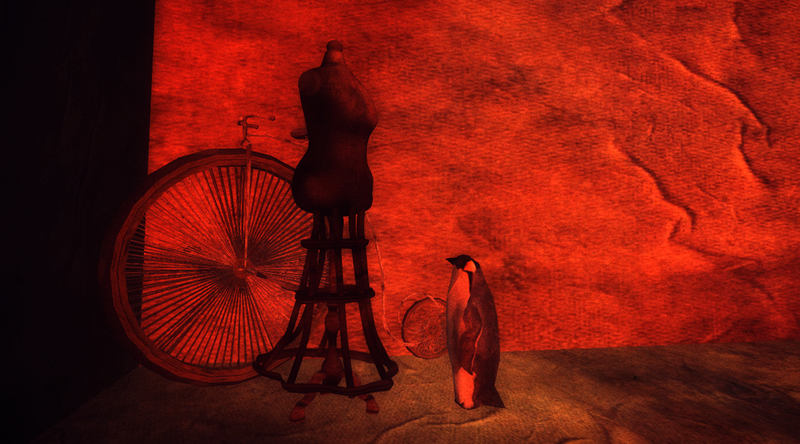 Often the avatars I chat with bring up Bryn Oh’s name and they hold her work in high regard. I’ve listened to them, looked at Flickr photos taken at Immersiva and left the visiting and posting to others. One of the avatars on my contact list, a lovely sort whom I met at one of Squonk’s exhibits some years ago, is on the list for the sole reason of an offer to help me navigate a Bryn Oh installation should I ever wish. I felt satisfaction in having a brief exchange with her on one of my visits to this installation as a friend and I explored the apartment building the same time as she. I found Hand to be a worthwhile experience even with my above mentioned challenges. My first visit was (accidentally) before it officially opened, having seen a photo and link on Flickr. The lack of a crowd helped me ease into looking around. I needed to accept an “experience”, something I’d not done before. To visit Bryn’s Immersiva, that only needs to be done once. 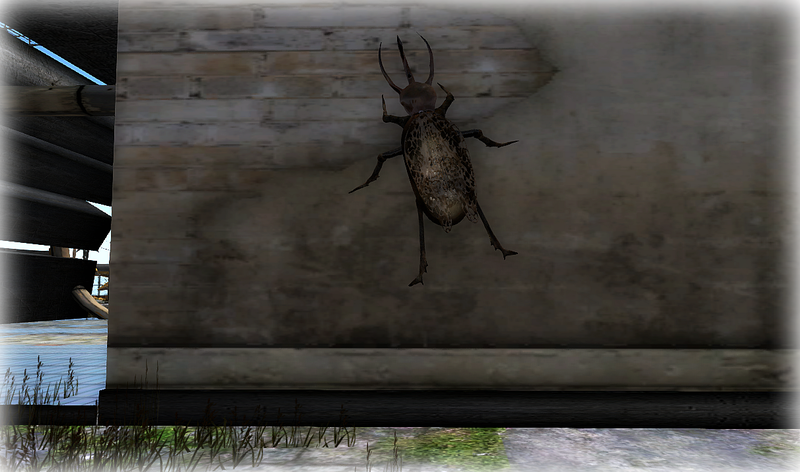 The HUD has shown up again when I’ve returned and disappears when I teleport out. I did need to turn my graphics up higher to see the particle ball that would teleport me in to the exhibit; I believe I left it on high for these photos. 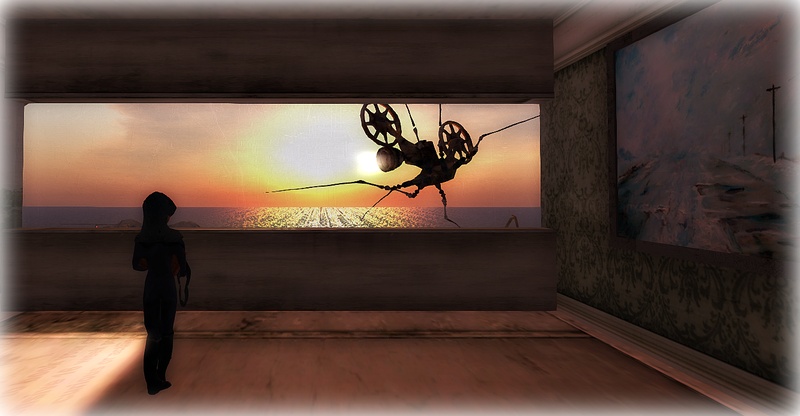 I chose sunset or midday light on the Lab Viewer so I could best see. The sim isn’t more laggy for me than I’m accustomed to elsewhere. I didn’t click on every single thing but everything I did check out was made by Bryn except for one HPMD bird in the apartment building. I am amazed at all the different media that went into this project. Somehow all the pages of the story arrived in order; I was less interested in the narrative than in the immersion into the world. I did need help navigating. After falling about 15 times attempting to get into the apartment building I asked a friend to teleport me onto each floor. (Some of them I could manage on my own once in the building.) We had an interesting conversation about accessibility and the rights of artists to create as they wish. I enjoyed my subsequent visits and feel I can suggest it as a destination for first time visitors or for those without the recommended set up. 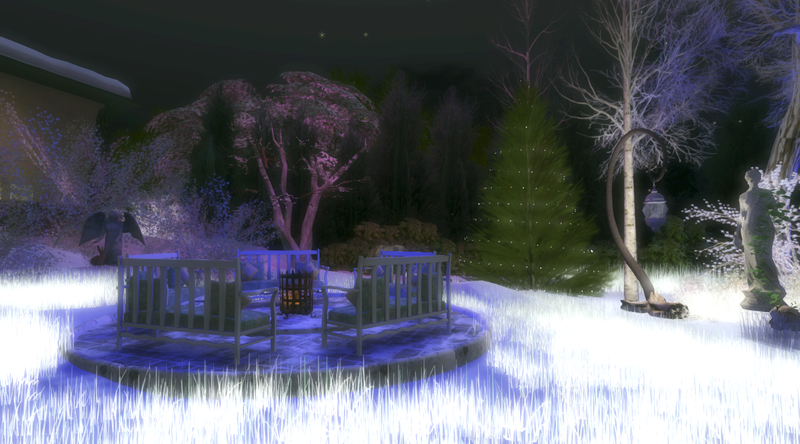 Photos of how the sim is meant to be seen can be found online as well as blog posts in which Bryn Oh has given information to the blogger. I do believe that of any creations that might still exist of our virtual world hundreds of years from now, Bryn Oh’s art would be among them. It (Hand) is a little too dark for my personal preference lately; I’m glad I checked it out. Some doubt as to the future of the Immersiva sim has been expressed; you might want to visit before the end of this month. Donations can be given. This avatar chose to go out of control playing the gacha machine instead. 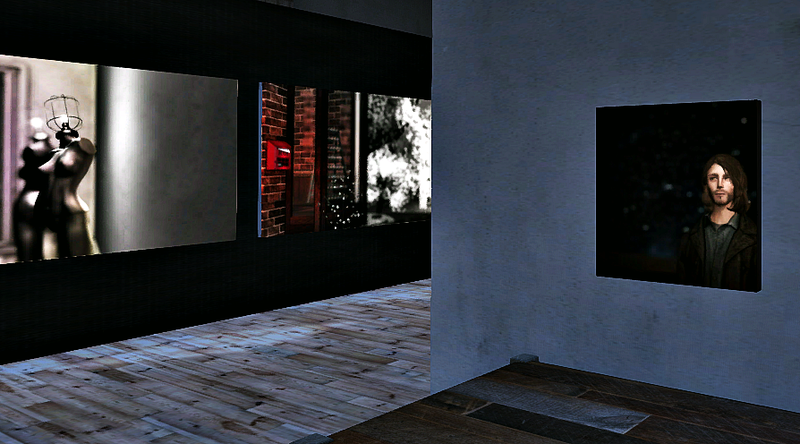 Now on exhibit through the end of February, Just Pics is a series of ten photographs by Pixel Crescendo. 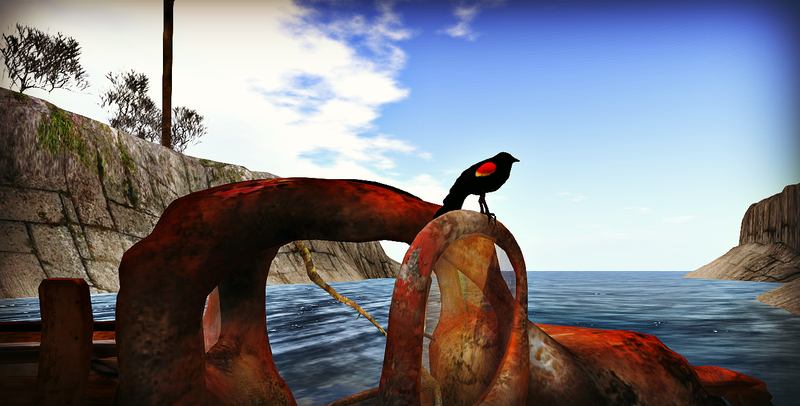 Taken in Second Life of places Pixel has liked to spend time, they focus on subtle details in a way that leaves them open to interpretation. Pixel is a contributor to the art collective Cybertwigs. In world he has accepted invitations to do private projects and to exhibit at Wanderlust Bench Art Park. This is his first gallery show. The photos are not for sale but copies may be taken.